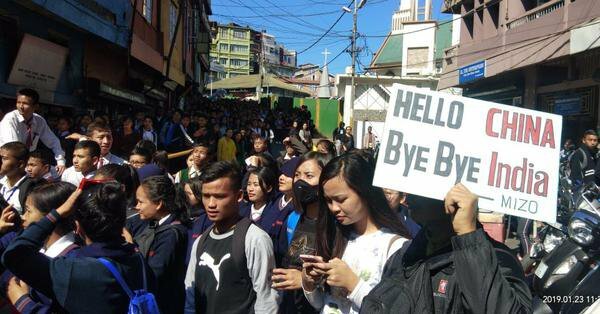 The protest against the Citizenship (Amendment) Bill, 2016 in Northeast has taken such a turn that a section of Mizo students had to shout slogans like ‘Hello China, Bye Bye India’ in protest against the Bill on Wednesday. According to reports, thousands of young protestors took to the streets in different towns of Mizoram to protest against the controversial Citizenship (Amendment) Bill, 2016. A report published by Scroll.in stated that many of the protestors held banners that read as: “Hello China, Bye Bye India”. The North East Students’ Organisation, an umbrella body of students’ organisations in the region, organised the protest rally along with the Mizo Zirlai Pawl, which is Mizoram’s most influential student body. It may be mentioned that the Bill, which has already been passed in the Lok Sabha, seeks to grant citizenship to Hindu, Buddhist, Sikh, Christian, Parsi and Jain migrants from Bangladesh, Afghanistan and Pakistan if they have lived in India for six years, even if they do not possess the necessary documents. The move of the BJP-led NDA government to get the Bill passed and become a law has created strong reactions from several groups across the Northeast which claim that if the Bill is implemented, the interests of the indigenous people of the region will be badly affected. The Bill is yet to get Rajya Sabha nod. It has been reported that over 30,000 people, most of whom are students and youths, attended the Aizawl leg of the rally against the Bill. After Meghalaya Chief Minister Conrad Sangma threatened to sever ties with the Bharatiya Janata Party (BJP) over the passage of Citizenship (Amendment) Bill, 2016, in Parliament, Mizoram Chief Minister Zoramthanga, another NDA partner in the Northeast, has also opposed the Bill. The NDPP-led Nagaland government, where BJP is one of the partners, has also demanded review and re-examination of the Bill. The Mizo organisations reportedly said they would up the ante of the protests if the Central government sticks to its stand in “favour of illegal migrants” as the Bill would provide Indian citizenship to lakhs of foreigners taking shelter in the country. “It means the people of Mizoram are not taken into consideration by the Union government. If that’s the case, we are not also not interested in being India citizens. We better be with China, where the people also belong to Mongoloid tribes like us,” the report further quoted Lalhmachhuana as saying.